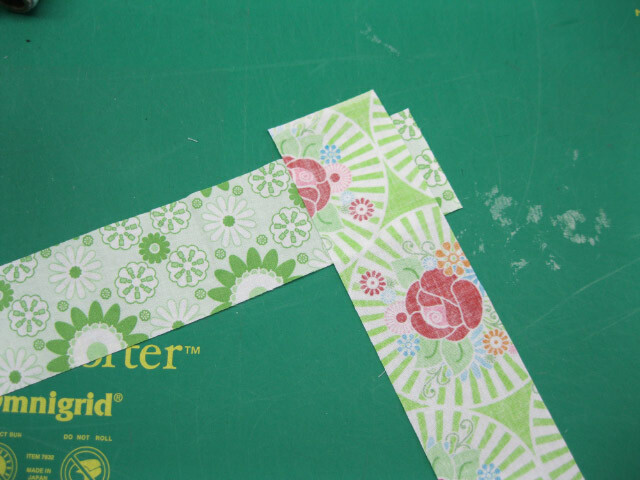 Of the classes I teach, one of the most popular ones is how to do borders and bindings. Here is a picture tutorial on how to do bindings on any quilt. I like narrow bindings that show about 1/4″ inch on the front of the quilt. My finishing is a little different, but it works and hides your ends. 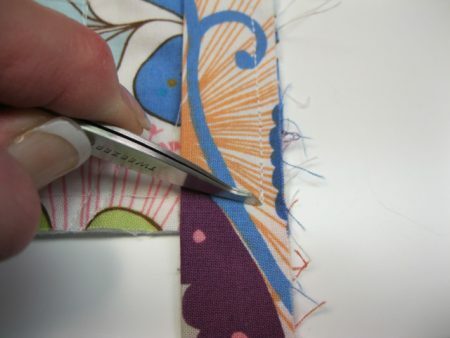 You can use this same technique with any size binding – simply adjust your measurements when joining the ends and cutting the binding. 1. 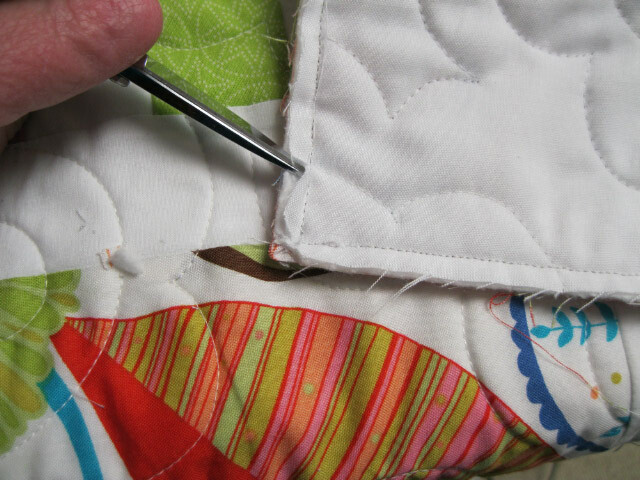 Once your quilt is quilted you need to trim the edges and corners. I use a large ruler and rotary cutter and trim based on the width of the border from the quilt. 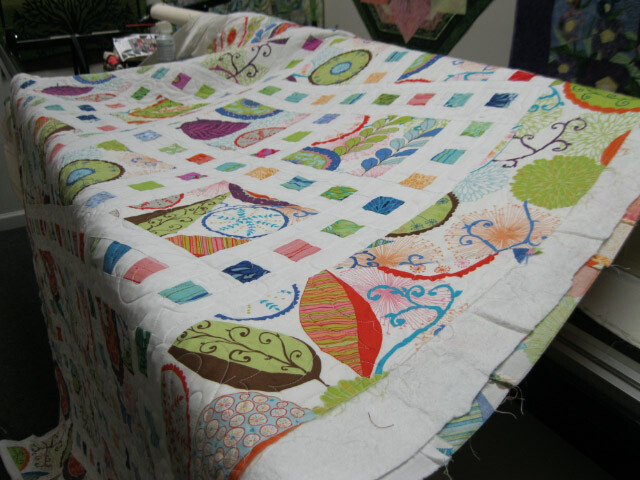 I attach a little bit wider border than I want on the finished quilt and trim to make it the desired width. 2. 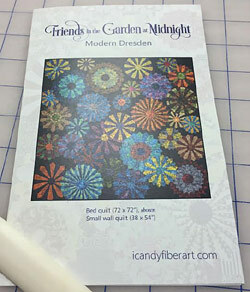 For this quilt, I’ve lined up the 2″ mark on the ruler with the inside edge of the border so I can trim for a 6″ border all around. Place a square ruler at the corner and line up the edges on both sides. 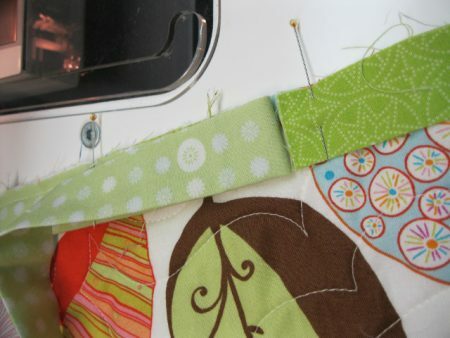 Trim any little bits away to make a 90-degree corner. 1. 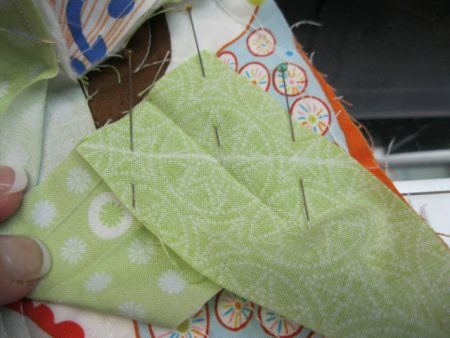 Measure the outside edges (circumference) of your quilt to get the total length you need for binding and then add 10-12″. 2. 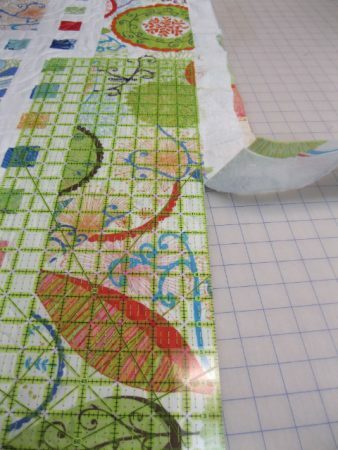 Cut your binding strips. 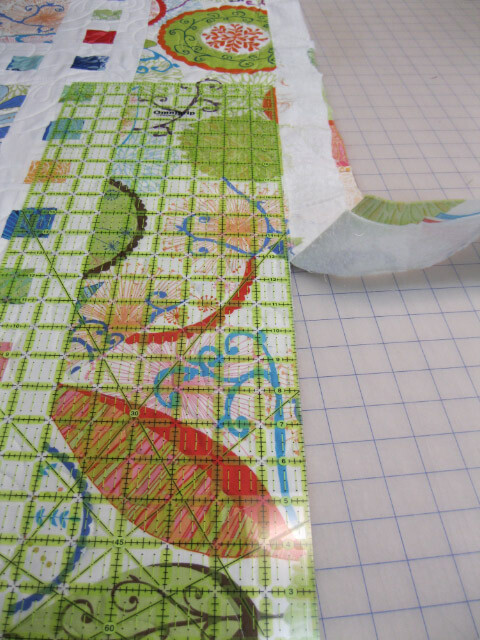 I cut my bindings 2 ¼” or 2 ½” wide from the full width of fabric, selvedge to selvedge. (Using the bias is a topic for another day!) For this quilt I used the full width. Excuse the crease it’s the only picture I have. 3. 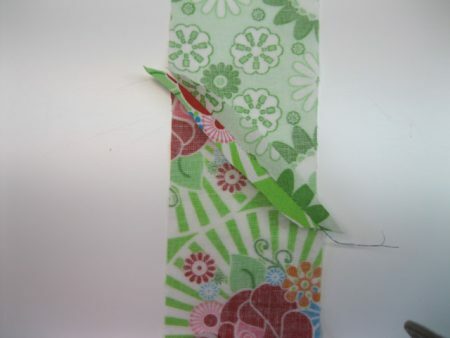 Piece your binding strips together so you have one long strip of binding. Lay them right sides together at a 90-degree angle with a slight overlap. 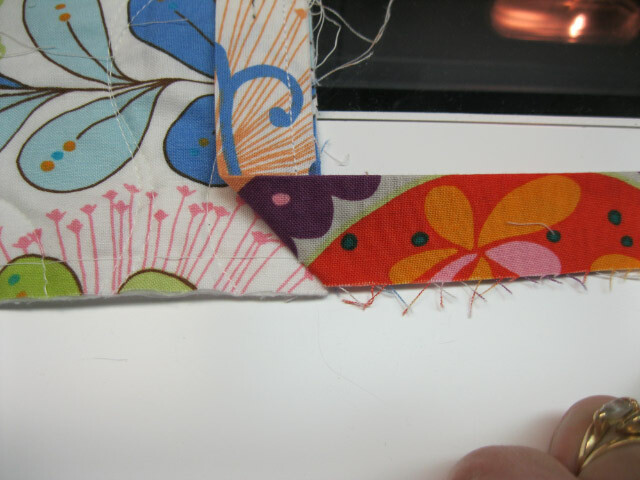 This overlap lets you see where to stitch – from notch to notch. You may want to draw a stitching line. The lines here are exaggerated to show you where to stitch. 4. Stitch. I like to think about stitching from Seattle to Miami. Upper left to lower right. 5. Trim after stitching to have a 1/4″ seam allowance. 6. Press this seam open to reduce bulk. 7. 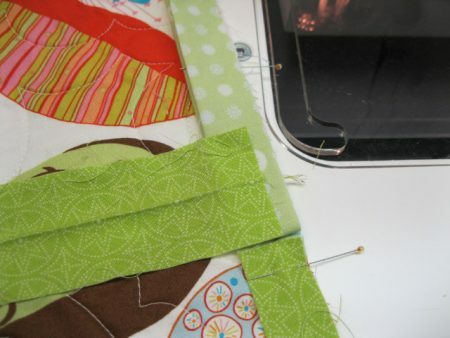 Seam together all your binding pieces to have your entire length of binding. 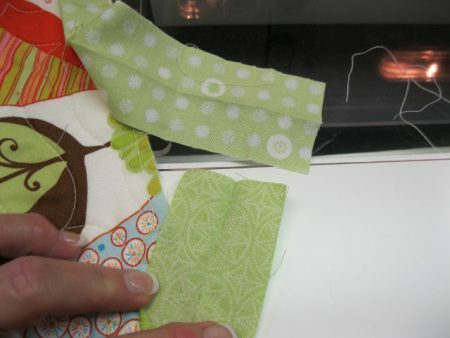 Fold it in half with the wrong sides together and press. 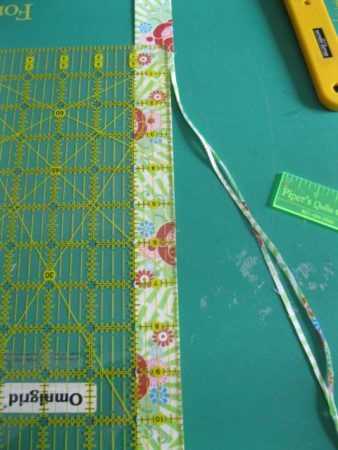 Now the binding measures just a bit over an inch wide and the dog ears are sticking out where your seams are. This is a little extra step. 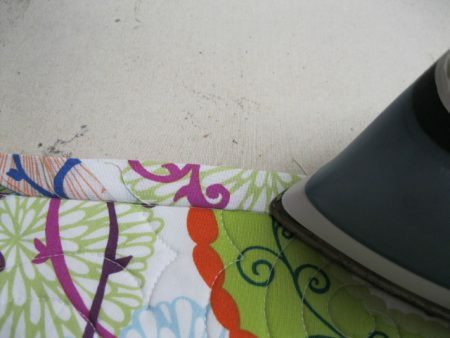 Trim your folded binding carefully.This removes the dog ears and gives you a very straight, even edge to sew to your quilt. For 2 ¼” binding I trim it at 1”. 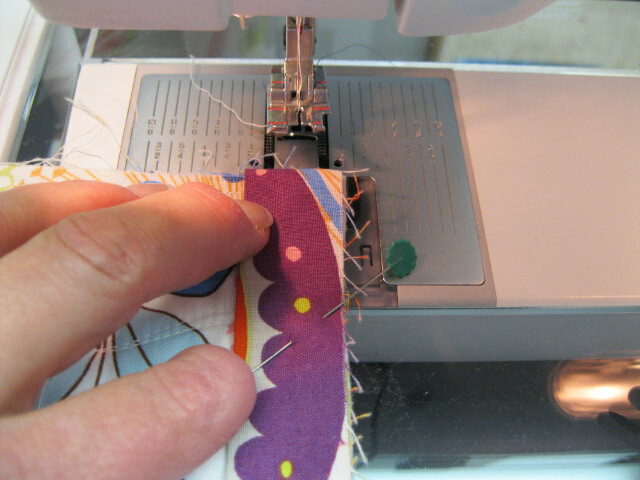 For 2 ½” binding I trim it at 2 1/8”. 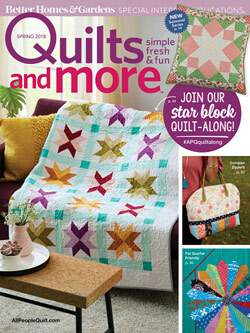 Get ready to add your binding to your quilt. 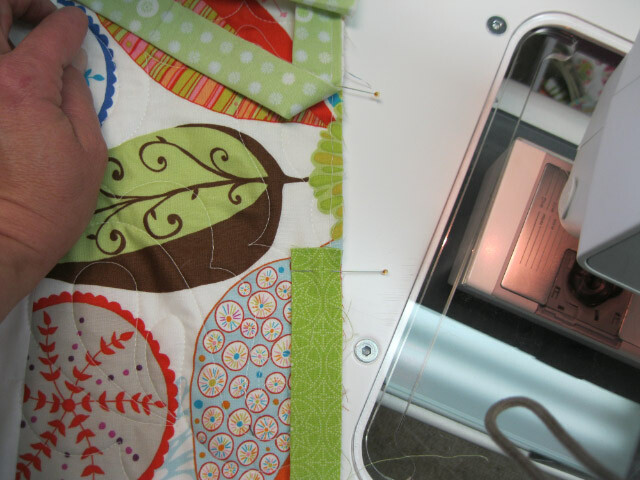 I lay the binding out completely around the quilt to make sure no seams are at the corners of the quilt. If they are, move the binding to avoid this. If it happens it’s not the end of the world, just too much bulk. I wind my batting up to keep it under control. 1. Start with your binding raw edges up against the raw edge of the quilt. Leave a tail of 8-10″. Pin. 2. Using a walking foot or a sewing machine with an even feed mechanism, start sewing with a 1/4″ seam. 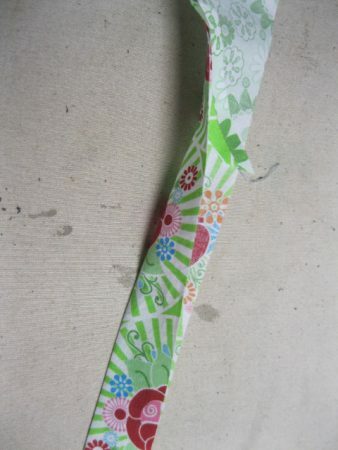 This will give you a nice tight binding filled with batting. 3. Stitch slowly and carefully along the quilt/binding edge until you are 1/4″ from the corner. Stop. Take a single back stitch. 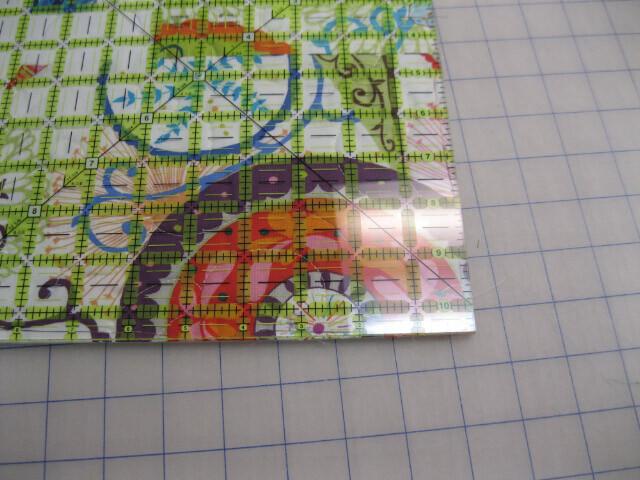 Here you can see the stitch stopped 1/4″ away from the lower edge. 4. To make a beautiful mitered corner on the binding, take the binding edge and fold it up and away from the quilt. (or out to right and away as the picture shows). 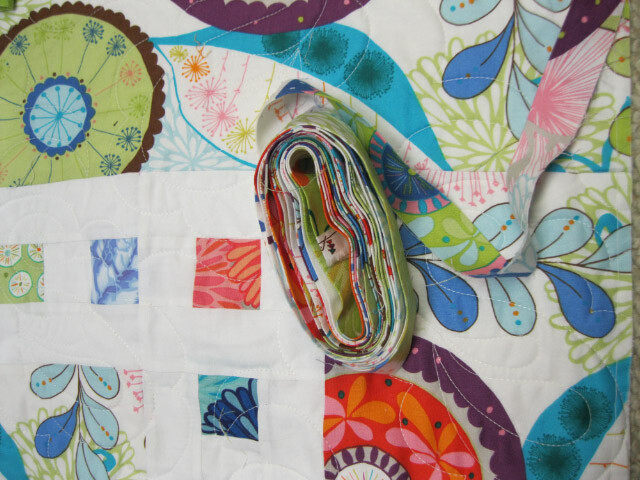 See how the binding raw edge is keeping a straight line with the edge of the quilt? That’s what you want. 5. Now, fold the binding back down along the quilt edge with the fold even with the edge you just stitched. 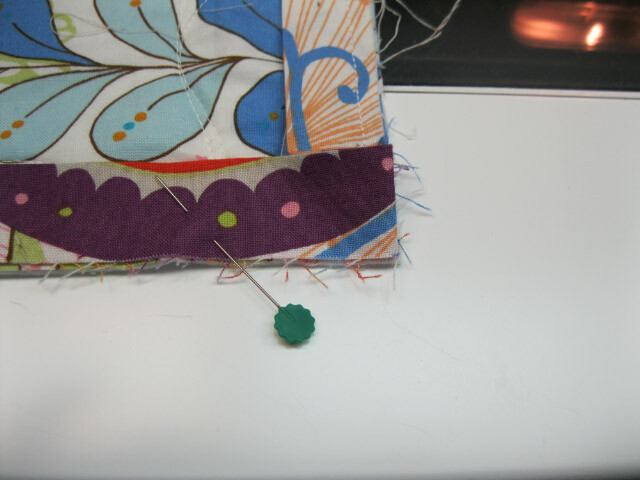 Pin so it stays until you get it back at the sewing machine. 6. This shows that fold and pin. The seam already stitched is on the right edge. We are going to stitch along the top/left edge next. 7. 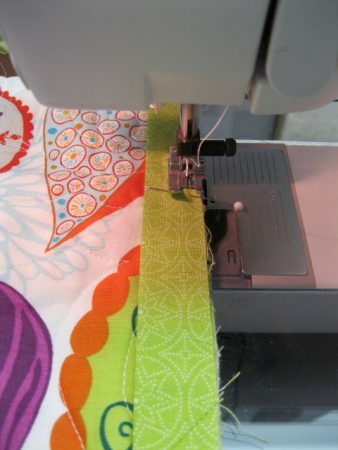 Go back to the machine and starting at the edge, stitch your 1/4″ seam and just keep going. 8. 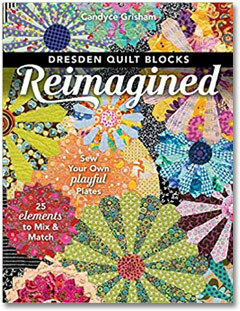 Continue with your other corners and edges, stopping when you are 10-12″ away from where you started attaching the binding. 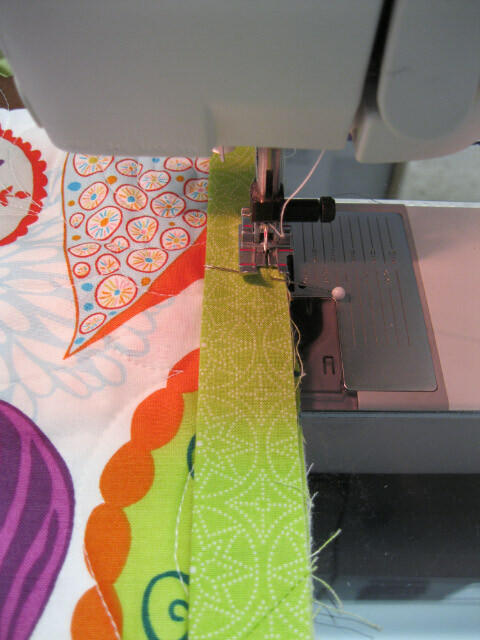 Stop stitching when you have 10-12″ between the end and your beginning stitches. 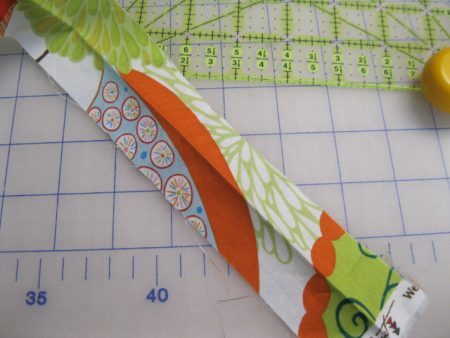 You are going to trim your binding ends so they are the exact length needed to sew a diagonal seam. 1. Cut off your lower binding piece (solid green) approximate 6″ from the stitch start. Save this piece. 2. Pin the lower binding in place. 3. 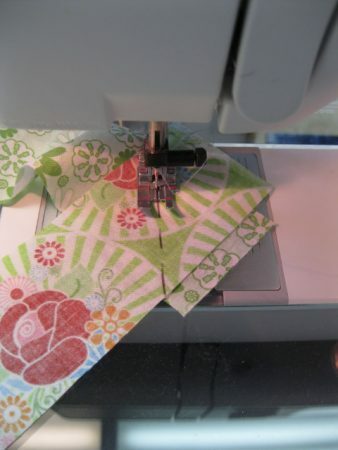 Bring the upper binding piece to meet your cut edge and fold it back on itself. See how the right side is pinned and the left is folded back at the cut edge. 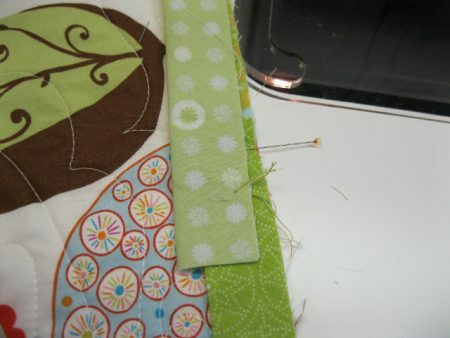 In other words, the solid lime green is pinned down with a cut edge. 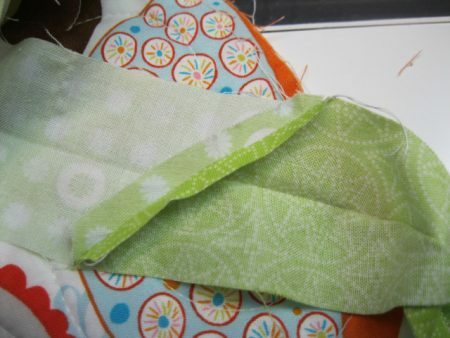 The lighter green (upper binding) is folded back on itself with the fold meeting the cut edge of the lower binding. 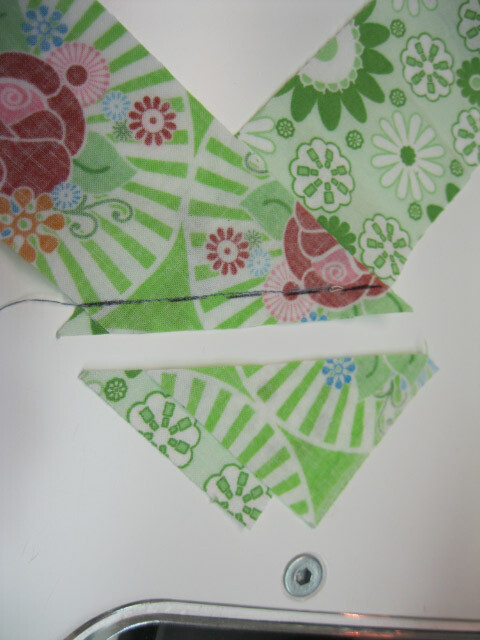 This shows the folded edge with the cut binding to measure where to cut. 5. Cutting the binding at exactly the correct place. 6. To make the seam, carefully open up the bindings (do not twist, I repeat, do not twist). 7. 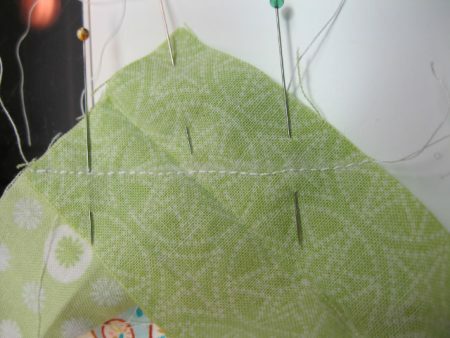 Pin them right sides together at a 90-degree angle. I find I need 3 pins to keep it from shifting. 8. 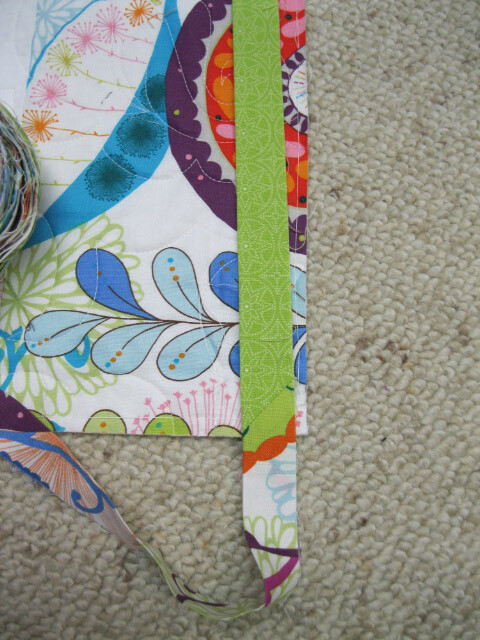 Draw a line to show where your seam will be. After a while you won’t need to. Think of this as a capital letter A. The legs of the A are your binding pieces and your seam is the cross bar. 11. 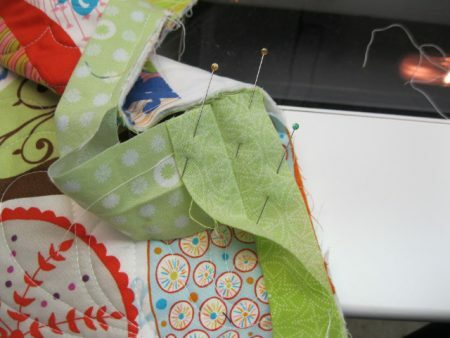 Once you know it fits, trim the seam, finger press it open and then refold the binding to finish adding it to the quilt. Almost done. 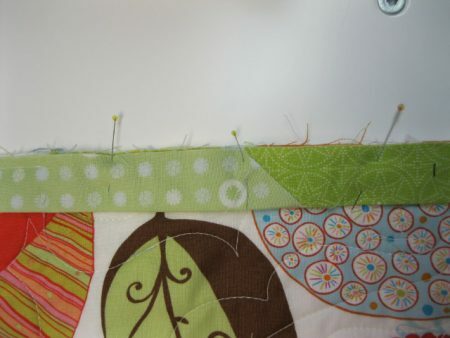 Sew the remaining binding to your quilt edge. 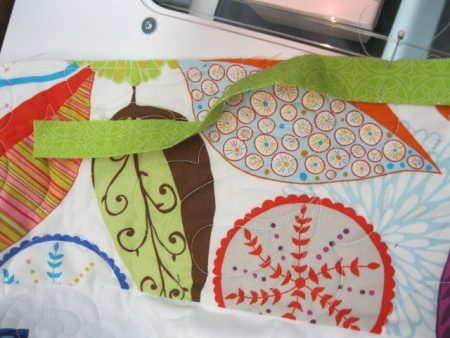 I trim away a bit of the batting and backing at the corners so when I sew the binding down it reduces the bulk. Here is a little bit of corner trimmed off. 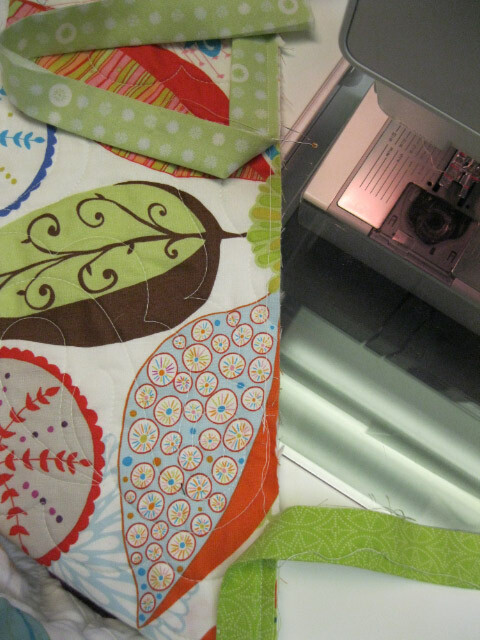 I like to press the binding out from the quilt just to tell it which direction it needs to go. 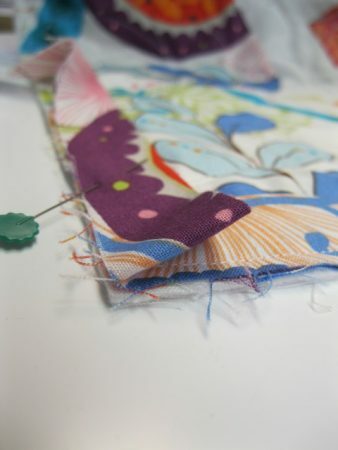 We are now ready to do the hand stitching to complete our binding. 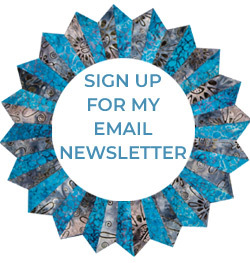 The next step is to flip this to the back of the quilt and hand stitch it down. 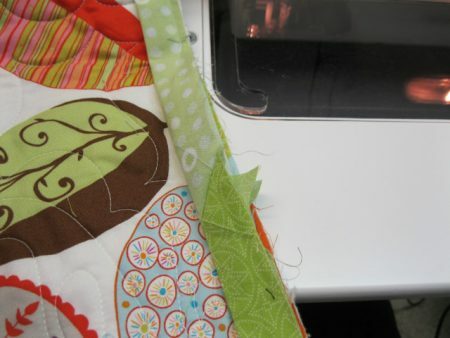 Use binding clips to avoid pins. I hope this gives you a clear picture of how to do a beautiful binding with mitered corners.